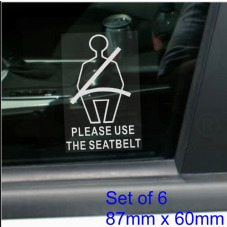 Platinum Place has a range of seat belt stickers designed to keep yourself and your passengers safe and secure in case of an accident. People, especially children can easily forget to put their seat belt on and if not noticed can result in injury. Warn your passengers that a seat belt must be warn in your vehicle at all times. You could be saving a life.